C.W. 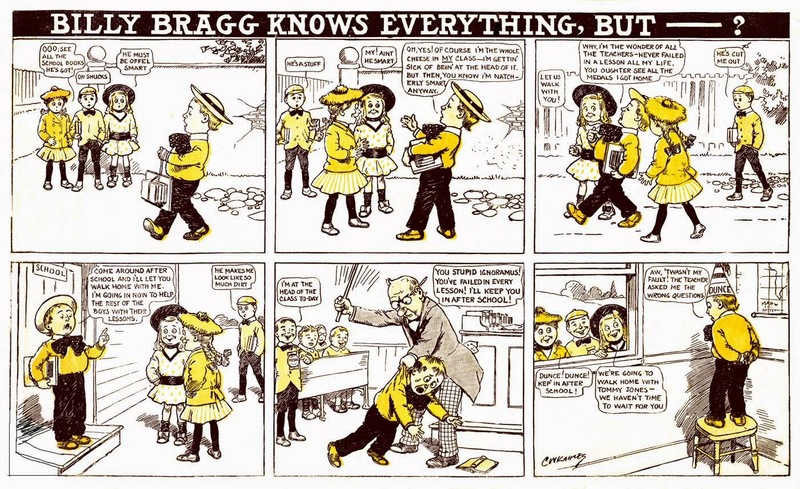 Kahles, the purveyor of some of the most slavishly formulaic strips of the early 20th century, here offers Billy Bragg, a kid who (wait for it, wait for it ...) B - R - A - G - S.
Okay. Now guess what happens when he brags. No, no, he doesn't win friends and influence people. C'mon. Try again. Yeah, now you got it! He gets his comeuppance. 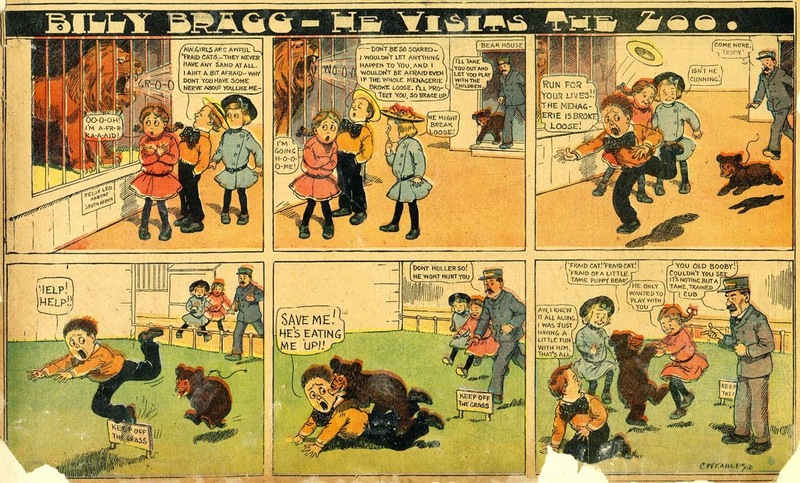 Y'know, lots (okay, most) early comic strips were formulaic, but there's something about Kahles' strips that I find singularly tiresome (you noticed my ugly mood, didn't you). I think maybe it's the cadence. Kahles in this period only seemed to know one tune, and exactly one way to play it. 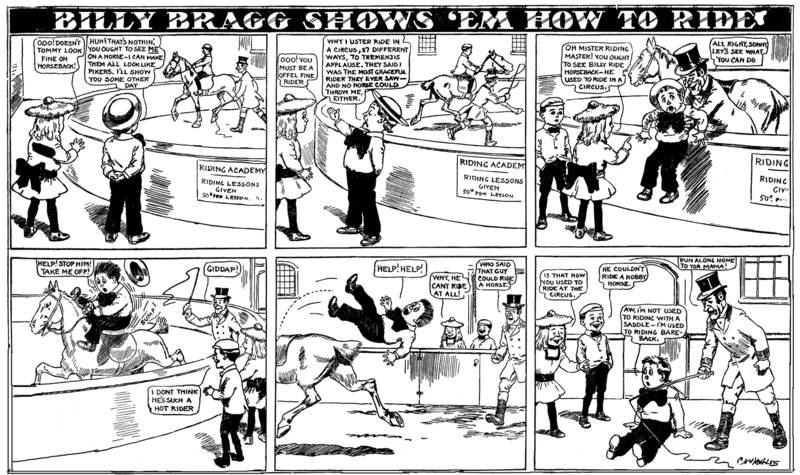 The consistency from strip to strip -- the unfolding of the story in exactly the same rhythm, is what really grates on my nerves. All I can say, then, is thank goodness Kahles eventually reduced his output to the generally delightful Hairbreadth Harry. Maybe in the oughts he was just cranking out way too much material to give any one strip a much-needed shot of originality. 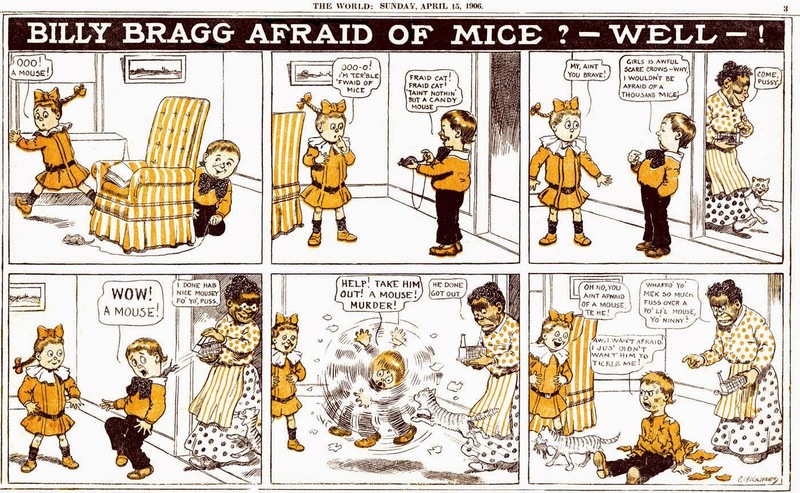 Billy Bragg ran in Pulitzer's Funny Side comic sections from March 4 1906 to August 16 1908. Much thanks to Cole Johnson for today's scans!